Altria stock needs a fresh catalyst, and it has the makings of one in its small-but-growing e-cigs business. Altria Group Inc. (NYSE: MO) stock had an amazing run from February 2014 to March of this year. In those 13 months, Altria stock shot up 64%. But since then the tobacco giant's shares have slid 9.4%. The strong performance of Altria stock may seem surprising, given that smoking has declined in the U.S. as regulations have tightened and health concerns have grown. But increased tobacco sales abroad and Altria's ability to raise prices have kept revenue rising. And yet Altria, like other Big Tobacco companies, knows that traditional cigarettes won't be able to provide future growth. Wells Fargo & Co. (NYSE: WFC) has projected that Altria's revenue from traditional cigarettes will drop in half from $14.8 billion this year to just $7.4 billion in 2023. That's why the Richmond, Va.-based company jumped into the e-cig market in 2013 when its Nu Mark subsidiary launched its MarkTen brand of e-cigs. Altria raised its bet on e-cigs last year when Nu Mark acquitted the e-vapor business of Green Smoke Inc. for $110 million. After a slow start about a decade ago, the e-cig market has picked up speed and is now growing rapidly. 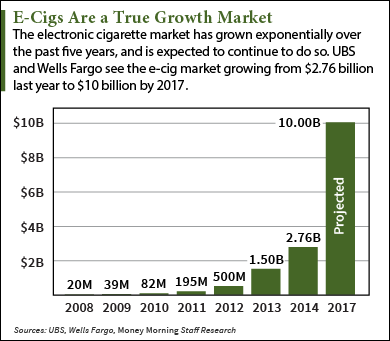 According to data from UBS and Wells Fargo, e-cig sales were just $82 million five years ago. Last year the e-cig market had grown to $2.76 billion, with sales projected to hit $10 billion by 2017. BIS Research has forecast that the e-cig market will grow to $39.6 billion by 2024. That translates to a compound annual sales growth rate (CAGR) of 27.3% – impressive for any industry. And that growth will be fueled by traditional smokers looking for an easier way to kick the habit or – more likely – a healthier way to maintain their habit. E-cigs heat a nicotine liquid with a battery, generating a vapor that exposes users to far fewer toxins than traditional cigarettes. "You have an available worldwide market of $780 billion from smokers that are buying things they're addicted to that is known to cause harm to them. And you have an alternative product that, from my perspective, is safer," cardiac surgeon Dr. Gopal Bhatnagar told CBC News.